In top form: Rothehram's Semi Ajayi. NOTHING quite annoys managert Paul Warne as much as his Rotherham United side being damned with faint praise. This said it might yet prove to be a handy bit of fuel for the run to season’s end. If the Millers’ chief has read once comments from rival players and managers citing his side’s’ competitiveness and physicality, above all else he has viewed them a hundred times. It has been the stock-in-trade response when opposing camps have referenced Rotherham’s collective qualities before games this term. As far as Warne is concerned it is simplistic and doing his side a disservice with the Millers much more than just a functional unit in his view. Comments in the match programme ahead of the recent Championship game at QPR proved a case in point and were harnessed to positive effect as the Millers secured their long-awaited first victory on the road at second-tier level in 44 games amid memorable scenes in the away enclosure at Loftus Road. The Millers, who are in the middle of a daunting run in which they tackle a host of big clubs such as Derby County, Nottingham Forest, Aston Villa, Stoke City, West Brom and Middlesbrough, can expect the condescending assessments to continue. Warne told The Yorkshire Post: “I use that as a bit of a force. If any player or manager puts anything in the press which is derogatory I tell the lads because I do not think they get the credit they deserve. “However, the counter argument to that is that Will (Vaulks) has got a call-up for Wales and Semi (Ajayi) has got a call-up for Nigeria. Vas (Kyle Vassell) has had call-ups for Northern Ireland, so there is respect out there. “But I just think that too many people hide behind the ‘oh, Rotherham are physical’ thing because it takes the pressure off them if they do not get the result. “I look at the QPR game and I do not think they played a lot different, if different all, really. “From day one we have used it as a bit of a force. I am not saying it will be a successful ending, but every bookie had us as favourites to go down, which gets your goat up straight away. “I remember when we started the season on minus 10 points (in 2006-07) and we felt that the world was against us. International call-ups for Vaulks and Ajayi add further weight to Warne’s argument with the dual recognition a welcome feather in the cap, not just for the players concerned but the club. Warne did not field any interest in his players in January, but expects that situation to change, especially if the Millers win their survival fight come early May. Ajayi’s burgeoning reputation as a goalscoring midfielder of repute after firing six goals in his past five matches is the sort that arouses attention. Vaulks is another whose performances are likely to have alerted other clubs with the Millers recently affording themselves a spot of protection by taking up an option to extend his contract by a further year until the summer of 2020. Defender Michael Ihiekwe has also signed an improved deal and Warne has revealed that further extensions could follow. On the prospect of summer interest in players, Warne said: “I did expect interest in January although I did not get it. I thought a couple of the players might have. “It all depends if we maintain our Championship status. I would like to think we can extend some of the contracts of the lads who are running low. But in fairness, if we were to be unsuccessful I would imagine some cherry-picking to a certain extent. “But that happens at every club. If Huddersfield go down their best player might, say, be picked up by Crystal Palace. That is the nature of the beast. 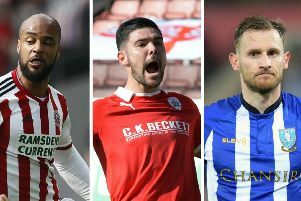 The Millers reside in the relegation zone ahead of the resumption of Championship business after the final international break of the season, but as far as their manager is concerned they remain well positioned in their quest to stave off the drop. Safety would represent a remarkable achievement, more especially given the financial disparity between Rotherham and virtually all of their rivals, with the Millers’ playing budget comfortably the smallest in the second tier. While a haul of 36 points from 38 games is not earth-shattering it is a tally in line with Warne’s expectations, with his third-from-bottom side trailing Reading by just a point and Millwall and Wigan also in close proximity. Warne, whose side’s weekend loss to leaders Norwich City was just their second defeat in their past nine league outings, added: “We are pretty bang on the money, really. Knowing how unbelievable hard it is to get one point, to sit here in March and think we have got 36, I am well pleased.